I am officially on the Chickpeas (garbanzo bean) wagon! Do you know about these little beans and how delish they are (and how healthy they are)? If you want to see just how good for you they are, you can read all about them on an awesome site, a non profit with the mission of promoting healthy eating called "The World's Healthiest Foods"
Anyway, I've been experimenting with a bunch of different recipes and have found some gems to share with you. My food motto is: "Good for you can taste good to you" (I know, pretty catchy). I am not one to eat something just because it's good for me...it has to taste great too. So with that in mind, I wanted to share some yummy/healthy recipes with you that have me feeling full and fantastic! The first comes from one of my new favorite blogs "Chocolate Covered Katie". She makes healthy deserts..no seriously, like spinach ice cream and zucchini chocolate grasshopper pie. Well...this one is AMAZING! I served it for dessert last night and everyone loved it (even my husband who can smell "healthy" a mile away). After they finished I told them it was primarily made of chickpeas! They were shocked and happy! She calls it "Blondie Batter Dip". It is just like a bowl of chocolate chip cookie dough. We dipped apples and graham crackers in it. Divine! Next up...Hummus! We love it on our sandwiches, crackers, as a dip for carrots...well really any veggie and just about anything else we can think of to put it on. I particularly love it with sun dried tomatoes, so this recipe is my new favorite. Last but not least...my new snacking addiction. Roasted chickpeas! Yummy...they kind of remind me of the corn nuts I had every once in a while as a child...but not as hard. So good. I found this recipe for Salt and Vinegar Roasted Chickpeas and found that I like them a bit more if I leave them in the vinegar for about 15 mins. instead of 30. YUM. Hope you try at least one of these...if you do, let me know! 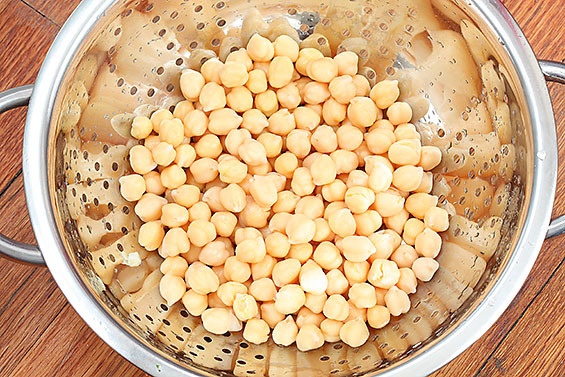 Do you have any great chickpea recipes? I gotta go make some. Can't wait to try the Blondie Batter Dip. Thanks for sharing. Yay! Thanks for the recipes! I can't wait to try that blondie dip! I made these "Chick-en Nuggets" with oven fries for dinner tonight and I thought they were quite tasty. They link to their post where they have made a collage of your photos.